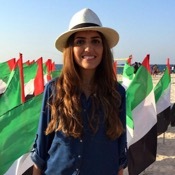 Traveler Review for Private Tour in Dubai, United Arab Emirates by Tour Guide Nada B. About Nada B. Message Nada B.
Nada is a wonderfully, knowledgeable guide. Communication was easy, Nada arrived on time to pick us up at the hotel and made sure we were always comfortable. We had a terrific tour & ended with a delicious lunch. I highly recommend the Old Dubai walking tour it's a great way to get to know the heritage & culture of the city. TOUR GUIDE RESPONSE: Dear Katherine, Thank you so much for taking your valuable time to review the experience. I'm thrilled to hear that you had a terrific time, and enjoyed our lunch together. I personally had a great time showing you around the city and sharing my Dubai! Much appreciate your kind recommendation!